While many industries of the Vietnamese economy are growing rapidly, perhaps the most exciting is electronics. Imports have nearly tripled from 2011 to 2016, while exports have increased by nearly 5 times — rising from US$12.8 billion to US$65.8 billion in 2015. In 2015 alone, electronics exports nearly doubled, something that took aggregate exports nearly four years to accomplish. In the years ahead, the implementation of key trade agreements, strong demographic tailwinds, and supportive government policies are likely to continue this trend and present a variety of opportunities for investors. 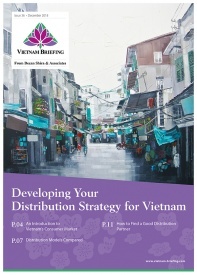 To tap these trends effectively, it will be critical to understand recent events in electronics production, the structure of Vietnam’s electronics sector, and prepare to meet opportunities as they arise. In 2014, the electronics industry made up 23.4 percent of Vietnam GDP. At the beginning of 2015, Vietnam’s electronics industry is the 12th largest exporter in the world and the 3rd largest in ASEAN, but at this rate, the nation is expected to climb up the list very quickly. It has already surpassed the goal of US$40 billion in electronic exports by 2017. Top countries for Vietnam’s electronic exports in 2014 were United Arab Emirates (US$3.8 billion), United States (US$3.1 billion), China (US$2.7 billion) and Japan (US$2.7 billion). For imports, China ($13.8 billion), Korea (US$8 billion), Japan (US$2.8 billion), and Singapore (US$2.5 billion). The vast majority of the electronics industry in Vietnam is dominated by foreign companies, particularly multinational giants. In 2015, US$10 billion of FDI came from multinational corporations, such as Samsung and Panasonic. FDI holds 80 percent of local market share and 90 percent of total electronic exports come from FDI. The first quarter of this year, FDI already reached US$4 billion. 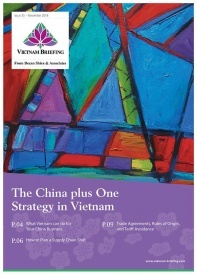 Companies looking to invest in Vietnam can take advantage of many of the Free Trade Agreements (FTAs). With many agreements signed through its membership in the Association of South East Asian NationsCurrently, the average tax in the EU was 2.8 percent and those countries with most favored nation status, the average tax was 7.9 percent. Under EVFTA (EU-Vietnam FTA), the vast majority of these tariffs will be eliminated. While these tariff breaks offer a tempting way to lower export costs, it is critical to be aware of the rules of origin in each FTA. Currently, domestic electronic enterprises are not adding much to the supply chain, since most materials are imported. To qualify under the agreement, there must be a sufficient transformation within Vietnamese borders, which must be much more than simple assembling. These agreements incentivize a higher localization rate—companies must invest more intensely and import more advanced technology. 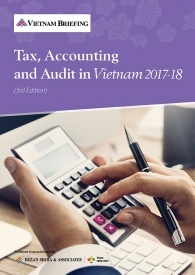 Not only can investors take advantage of reduced tariffs, the Vietnamese government provides corporate income tax (CIT) breaks for companies working in the high technology sector and/or in high-tech zones. The preferential tax rates are 10 percent for 15 years or 17 percent for 10 years, as opposed to the regular rate of 20 percent. Investors may also be eligible for additional tax holidays when they first invest: a 4-year tax exemption and a 9-year 50 percent reduction for those qualifying for the 10 percent CIT rate; a 4-year tax exemption and 5-year 50 percent reduction for those operating in certain areas; a 2-year tax exemption and 4-year 50 percent reduction for operating in certain areas or in some industrial zones. For R&D projects, 10 percent of annual profits can be placed into a tax-deductible fund before tax is levied. In order to further encourage growth, the government is easing restrictions on where foreign companies can invest. Regarding electronics, under the WTO, the only major restriction is on certain electronic games. 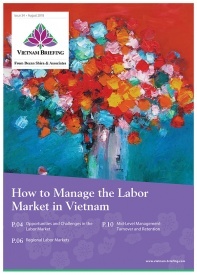 Nonetheless, the nature of the electronics industry and the constraints of Vietnamese labor and infrastructure pose many other considerations for potential investors. Electronics in Vietnam are dominated by tech giants and these corporations are in desperate need of suitable local suppliers so, for SMEs, the opportunity seems to be in supplying parts or services for larger companies—helping to add value and move up the supply chain. 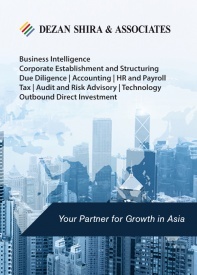 Furthermore, the country has a shortage of skilled labor, but with the ASEAN Economic Community, it will become much easier for individuals to travel for work within the region and largely relieve this problem. Vietnam is also working to improve its infrastructure to the satisfaction of international investors. According to the World Economic Forum Global Competitiveness Report, Vietnam ranks 67th for transport infrastructure and 78th for electricity and telephone infrastructure. Roads are particularly weak, ranking 93rd, but railroads are somewhat better— coming in 48th. To avoid many of these problems, investors are advised to operate in tech zones, where they are already equipped with the necessary infrastructure and facilities. As an added bonus, the operation may qualify for CIT breaks, as mentioned above. Given the rapid growth of electronics production, trade, and investment seen in recent years, the time has never been better to make use of Vietnam as a cost center for larger Asian operations or as a full-fledged production hub. 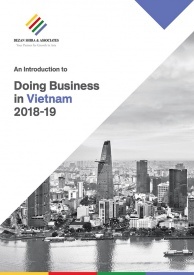 For those keen to explore Vietnam’s emerging investment landscape, a clear idea of where to invest and sell goods, and an understanding of how to structure operations to take advantage of trade agreements and tax incentives will provide a significant boost to any future projects.